Anyone who has been on a conference call can atest to the fact these phone-based meetings are just awkward. The strange background noises, the inevitable lapses in technology and the combination meeting attendee personality quirks make the whole experience boring and clunky. Enough with the drudgery! As they say when life gives you lemons to make lemonade, when business gives you conference calls, have some fun by turning them into games! 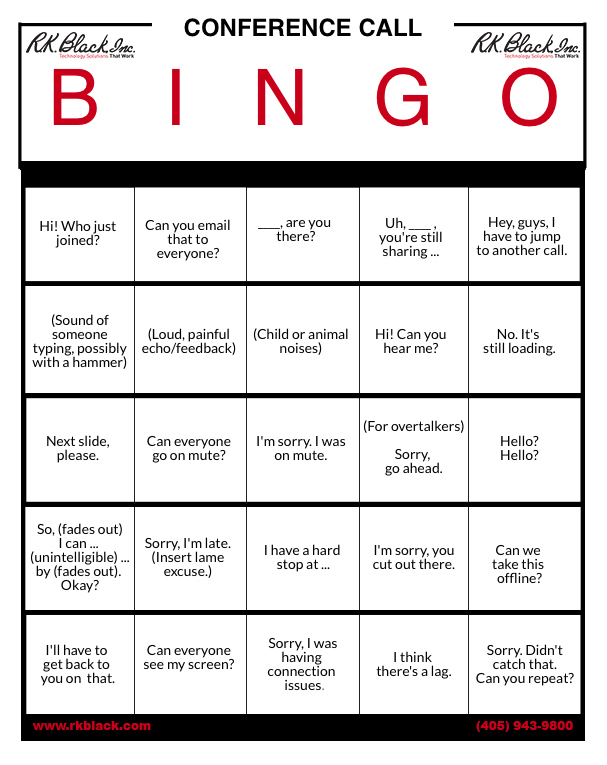 Next time you have a conference call, just download and print this "Conference Call Bingo" card we modified (credits to Facebook user "E Gilliam" for the concept) and take it with you into your meeting. Every time one of the conference call commonalities or similar happens, make note of it and see if you can make a B-I-N-G-O. You won't win anything other than your own personal entertainment and amusement, but doesn't that make it all worth it? R.K. Black, Inc. is an Oklahoma City-based leading provider of office technology solutions to small and medium-sized businesses in and around Oklahoma and Kansas. We specialize in everything business technology from copier, fax, printer and scanner technology to document management, onsite paper shredding services, VoIP phone systems and managed IT support to video surveillance solutions. If you're want to learn more about us, feel free to explore the website, read our other blogs or click the button below to be contacted by one of our reps and tell you! Also, be sure to keep watching our social media channels on Facebook and Twitter for more business tips from our blog.